When my mind towards dystopia it certain things come to mind: kids battling it to the death, uniformity of society, intense fear. You know the basic, seeing the ills of society and the struggle against it. I think gritty, harsh, futures that serve as a warning to society: if you become too complacent this too could happen. They are grim looks into futures we don’t want. The call to action that are to wake us up to the social issues that surround us. I don’t expect a breezy novel that feels like something that you would read on a warm summer day. 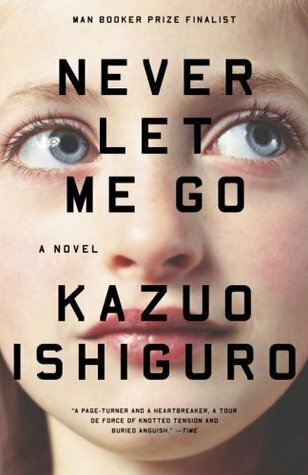 Yet that is Kazuo Ishiguro gives us in Never Let Me Go. The novel is told by Kathy and set in the country side of England on the grounds of Hailsham, a school that is “a shining beacon, an example of how we might move to a more humane and better way of doing things.” She and her friends spend their days being “creative” while going about their lives dealing with friendship troubles and trying to fit in. However this school is far from normal. The “Guradians” who run the school push the students to create because it could make the difference as they explain it. The truth is that the “students” are very sheltered regarding the world they are to enter. Kath and her friends Ruth and Tommy from time to time talk about odd behavior of their “Guardians” and things they say that don’t make sense, but they never push further to get the whole story. Instead they often reflect on their experiences as if it were a puzzle they they try to put together when they have nothing else to do. Later Kath even reflects on how they were never really told anything. Every now and then they talk about the “donations” and “completing” but in a way that they know it a part of their life but they never really talk about it. After Hailsham the group is moved to the Cottages where they remain until they will go on to training. Here their life revolves around trips they make and dealing with their hormones. It is almost comical to imagine a group of teenagers left to take care of themselves in a world they know nothing about if wasn’t for the heavy overtone of what is going to happen to them. The book ends with Kath’s days as a “carer.” Revealing everything the book is leading up to most of which we have already pieced together but hoped was misinterpreted. Kazuo leaves a bread crumb trail for the reader throughout the book allowing us to piece together the horror for ourselves while handing it to us in a pretty package of lazy days reading books and escapes to the pond for in depth chats. This book didn’t sit well with me. Kathy reminisces on life with Tommy and Ruth, growing up at Hailsham, time at the cottages, and eventually her role as a “carer”. She even looks forward to ending her time taking care of the those who are making her “donations” and going through it herself almost as if it is a reward for her years of exhausting service. There is very little fight just acceptance of the fate that was spelled out for them at birth. The idea of giving their vital organs and understanding that it will kill them is as natural as breathing in their world. They don’t try to change it. After coming off of reading Do Androids Dream Of Electric Sheep where androids fight to lead a human life where they aren’t forced to retire (a.k.a. be terminated) I expected struggle or at least pushing back when they find out that not all “humans” see the clones are soulless beings. It doesn’t happen. Instead society puts them out of sight, forgets about them when they are no longer a hot topic cause, and even has an enormous amount of fear regarding them despite the fact that they depend on their donations to improve their own quality of life. This novel hit me harder then what most dystopia novels ever could and Kazuo drove home his point beautifully. It’s a warning about when we blindly accept the world around us without seeing another way. Just because something is an accepted part of life how much should we ignore when it gets complicated? It’s haunting because the truth of this book is closer to our reality. It isn’t hinting towards our future, but warning about our present. When we look the other way is when we loose our humanity.